This week’s club focus is on MECha. The MECha club has one big goal in mind, and that is to show students the wonders of the “college life” and hopefully make members want to pursue a higher form of education beyond high school. 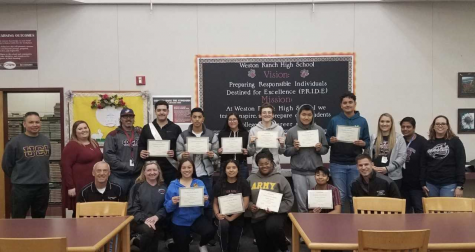 For the past five years, Mrs. Cervantes has been working hard to achieve that goal with the variety of students who have come and gone throughout the years. Every year the MECha club visits a variety of universities around California from Stanford University to UC Berkley and exposes club members and potential students to the campus, staff, and its students. This year alone the club has gone to Stanford University, UC Davis, and most recently San Francisco State University. Their latest trip to SFSU was taken on Thursday, March 28th and was reported to have been a tremendous success for the club. MECha spent about 200 dollars in fundraising funds planning for the trip, and the club had a stellar day visiting the prestigious establishment. A total of 14 students attended the tour, and all are eager to visit their next university. How is the club able to visit these universities you may ask? Well, according to Mrs. Cervantes, it is all thanks to the small government they have set in place within the club. Every year the students vote on who they would like to become the club officers in charge of planning, fundraising, and paying for all their trips. There are a variety of officer positions available from President to even treasurer, and anyone put into these positions must be elected through a campaign. This year’s election has not taken place yet, but the last person to serve as president was 4-year Club member David Corona, who Mrs. Cervantes believes to be one of her most vocal and respected leaders throughout her history in charge of the club. Mrs. Cervantes has been delighted with her time advising MECha and hopes to have many more students to join soon. Interacting with the students and helping them become culturally aware of life after high school is what she enjoys the most from it all, and she is always happy to see another excited face walk through her club’s door.